Rousseau Metal Drawers in Shelving. For Rousseau or just about any brand. Add to your existing shelving units! 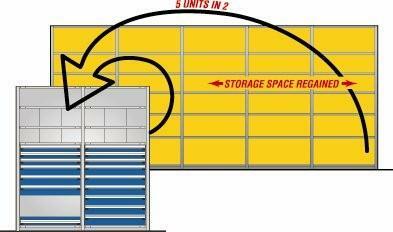 High density Rousseau modular drawers are a great solution to maximize the efficiency of your existing parts room. Even if you think you are out of space, adding these drawers to your existing shelving can free up considerable space and increase productivity in any parts room. Rousseau Metal offers these pre-configured high density modular drawer systems for their Spider Shelving System along with the incredibly versatile option of utilizing these high quality drawers in more than 35 other manufacturers shelving so that you can save money and increase your storage space, without having to replace your existing shelving. Using these drawers in your existing shelving is as easy as matching the brand and model shelving you have to one of our special brand specific mounting brackets available. If you do not see the brand you have, more options are available off-line. or save by retrofitting your existing shelving with Brand Specific mounting brackets. This page lists drawer kits ONLY, all shelving must be purchased separately or utilize your existing shelving. Shelving is not included with the items listed on this page. Click here for a video on installing Rousseau Drawers in Shelving.